Tickling trivia from Lite FM. 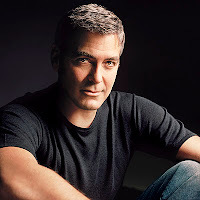 In a campaign to encourage people to stop eating meat, it has been suggested that a new type of tofu be made with George Clooney's sweat. Surely no one can resist the taste of one of the sexiest men alive? Tofu is bland enough; but I don't think adding in "salt" is going to make it any more palatable. Sorry, George, as hot as you are, I do not consider your sweat appetizing. he may be hot but no thanks! seriousleeeeee.